performing no additional voluntary duties, such as out of hours cover, covering for colleagues (unless such cover is contractually required), or attending open days etc. undertake no duties that breach statutory guidance, health and safety policies or other significant employer’s policies. 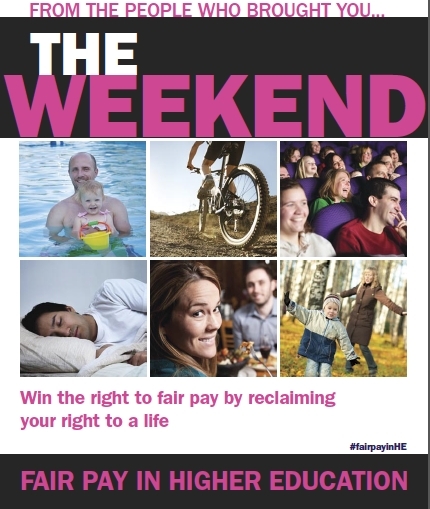 As ever, UCU@GCU will be encouraging members to take lunch breaks, leave on time and reclaim the weekend. It’s a bank holiday weekend coming up and the forecast is for sun, so perhaps you can make a start on the weeding or simply pot up some basil seeds for your windowsill. There’s plenty of outdoor activities going on around the Glasgow area as well as theatre, exhibitions and events, including the Southside Fringe Festival. You can start planning your weekends from here: http://www.whatsonglasgow.co.uk/ Use the #fairpayinhe twitter hashtag to keep us up to date with what you’re doing instead of working all those extra hours you always do. This entry was posted in UCU, workload and tagged Salaries, strike, UCU on May 27, 2016 by unionadmin. Starting with Dolly Parton’s ‘Nine to Five’ – surely a workload issue – and finishing rather ironically with Sinatra’s ‘New York, New York,’ our spotify playlist (entitled IndustrialAction2016) provided a very suitable backdrop to the varied discussions we held on the picket line on day 2 of our current industrial action. Focussing today on casualised contracts, our helium balloons targeted zero hours and again got an appreciative response from passing cars. Despite it being the second consecutive day of action, the picket was again well attended and by 9 a.m. covered both main gates. Our postgrad members were very active again from early morning. Asked what they thought of the 1.1% ‘offer’ their unvoiced opinions weren’t hard to discern..
We were pleased to welcome Natalie as a new member of UCU. A PhD student at GCU, she baulked at the idea of crossing a picket line, so solved the problem by joining on the spot – then staying to support us. As editions of the Glasgow Herald, and then the Evening Times hit the picket line we were also glad to see that our VP Catriona Mowat, had made the front page of the Herald, and our President Douglas Chalmers (talking as President of UCU Scotland), had also featured prominently in the Evening Times. Douglas has pledged to get a union t-shirt in future in an effort to move from page 5 to page 1 in the printed press. At the end of the picket, a spokesperson from the branch committee thanked all those attending, and reminded everyone that the UCU would be issuing guidelines to members about their ‘working to contract’ position, which was now operative from the 25th May. This entry was posted in UCU, workload and tagged Salaries, UCU on May 27, 2016 by unionadmin. A continued campaign of innovative activity on a whole range of issues affecting academic and academic related staff in Scotland’s universities is the way forward for the University and College Union, according to presidential hopeful Douglas Chalmers. Having served as Scottish Vice President, for the last 2 years, Douglas is hoping to be elected in the current ballot which is open until February 27th. A believer that trade unions are the natural community for all staff at university, Douglas believes that the UCU should be a core defender of the wages and conditions of staff – but also much more than that. In his view it is action on a whole range of questions that affect the life of staff that makes the best case for people to join. He points to the local branch’s work on International Womens’ Day, support for equality and diversity, student support, health and wellbeing, democracy in the university sector, as well as action on pensions and wages as being the reason that GCU continues to enjoy one of the greatest rates of growth amongst branches in Scotland. GCU branch member Catriona Miller put some questions to Douglas about his candidacy and regarding some of the main issues facing the union and Scottish education. This can be found below. A previous interview about Douglas’s views on building the union as a community, on working with other unions, on re-imagining universities, and on pensions, governance and working with the Scottish government is found below. This entry was posted in UCU and tagged Douglas Chalmers, pension, Salaries, UCU on February 2, 2015 by unionadmin. The University and College Union (UCU) said the figures, recently released as part of Work Your Proper Hours Day, highlighted how teachers and lecturers continue to go above and beyond the call of duty and put in the extra unpaid mile, despite real-terms pay cuts. The analysis reveals that over half (54.2%) of teaching professionals do extra unpaid work each week and, at 12 hours a week, they clock up more unpaid overtime than any other profession. Last year teachers were the third most likely group to be putting in unpaid overtime, behind finance managers and directors, and research and development managers. While both those professions have seen the percentage of staff clocking up unpaid hours fall, the percentage of teachers working unpaid hours has gone up. UCU general secretary, Sally Hunt, said: “Most people are putting in extra unpaid hours compared to last year, but even more teachers and lecturers are going that extra unpaid mile. Not only are teachers and lecturers putting in an extra hour a week of unpaid overtime compared to last year, they are also now more likely than any other group of professionals to be doing unpaid work. February 28 each year marks the TUC’s Work Your Proper Hours Day – the day when the average person who does unpaid overtime would start to get paid if they did all their unpaid overtime at the start of the year. Said Douglas Chalmers, local UCU President “Academic unions are in negotiation with HR at GCU at the moment to put together an acceptable and fair workload model. A successful workload model, would correctly acknowledge and regulate the excessive workload facing many staff in our university. After the model has been piloted in several departments, we will again consult with our members for their experiences with this. This entry was posted in UCU, workload and tagged Salaries, UCU, workload on March 31, 2014 by unionadmin. UCU General Secretary Sally Hunt has written to members to confirm that a date has been set for members to begin an assessment boycott in the current pay dispute. She wrote: ‘The Higher Education Committee met to review the current dispute and agree next steps. It was noted that members had already taken substantial industrial action in the campaign for fair pay and that in the continued absence of any movement from the employers, further escalated action would be necessary. ‘Having examined assessment timetables, HEC therefore confirmed the implementation of a marking boycott with effect from Monday 28 April. ‘This is a serious but unavoidable step for which the union will need to fully prepare members. ‘HEC therefore agreed that between now and 28 April the union should prioritise working with branches to maximise the impact of a marking boycott, including in the minority of institutions where most assessment has already been done. She added that UCU will also begin ‘detailed discussions with our colleagues in the National Union of Students (NUS) on the impact and practicalities of a marking boycott. ‘It was therefore agreed,’ she said, ‘that our current claims which set out the case for fair pay and equality in HE be continued in any new negotiations until its terms are met. This is the position we will suggest to the other HE unions. No member I have spoken to wishes to see this dispute escalate, but in the continued absence of meaningful negotiations this is our only alternative. Even now the timetable HEC has set provides a window of opportunity for the employers to address our just demands, which I hope they take’. This entry was posted in EIS, UCU and tagged EIS, Salaries, strike, UCU on March 30, 2014 by unionadmin. 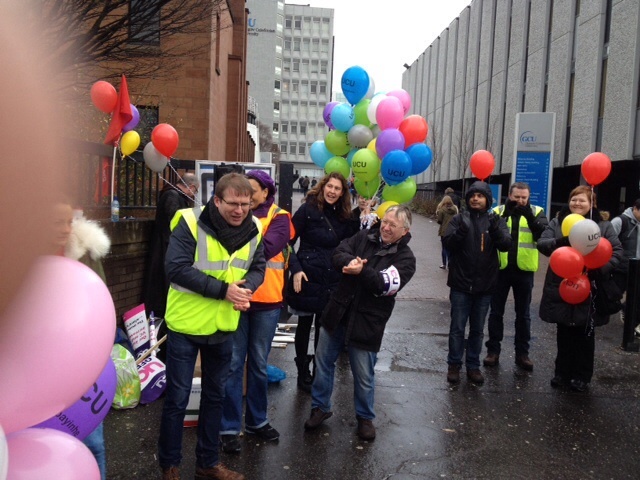 Helium filled balloons supplied by UCU and bacon filled rolls supplied by Unison helped make the joint picket by university unions UCU, EIS, Unison and Unite on 6th February the most successful yet in the series of actions in favour of Fair Pay at Glasgow Caledonian. In some ways this was the best organised of the actions so far, with posters informing the students of impending action having been put up on previous days, and a specially prepared leaflet featuring an appeal from each union given out to students on the day. Union reps indicated more reports of alterations to and cancellations of classes than had happened at previous actions. Even the worst of the weather stayed off, although spectacularly, mid way through the picket, the wind put an end to the gazebo which had played such a helpful role in the previous disputes! Pickets were out on all of the main entrances to the university with several delivery vans turning away after reading our leaflet, and many passing cars honking their approval of the action. 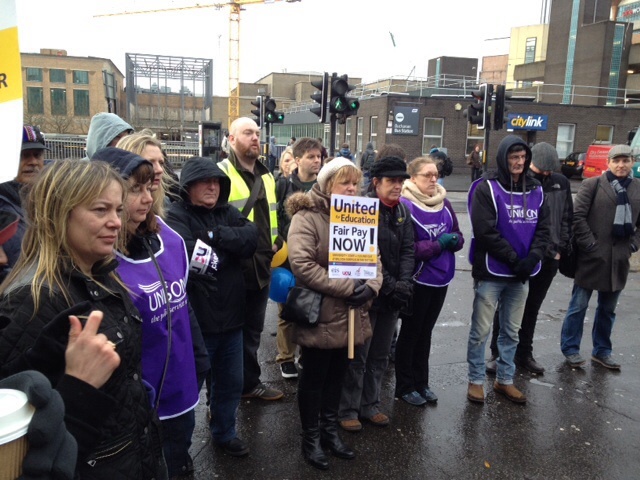 At a brief rally at 10.45 chaired by joint Union Convenor and EIS rep Nick McKerrell, Sinead Wylie brought the greetings and support of the Students Association, followed by Unison rep Davena Rankin and UCU rep Douglas Chalmers who spoke on behalf of their unions. Nick McKerrell closed the rally, pointing out that this had been a great example of the type of joint activity that the four unions at Glasgow Caledonian continued to do together very well. 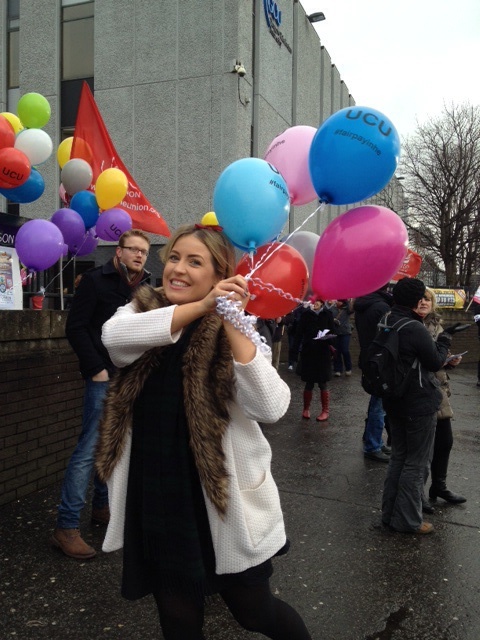 Following the rally, 100 of the helium balloons were released on a count of three to cheering before we dispersed, having shown once again the depth of feeling amongst staff that GCU should pressurise UCEA to come back to the negotiating table. PS the joint unions have already been offered another 3 gazebos to take the place of the one that lost its battle with the Glasgow weather. This entry was posted in Combined Union Committee, EIS, NUS, UCU, Unison, Unite and tagged Combined Union Committee, Davena Rankin, Douglas Chalmers, EIS, Nick McKerrell, Salaries, strike, Students, UCU, Unison, Unite on February 6, 2014 by unionadmin. 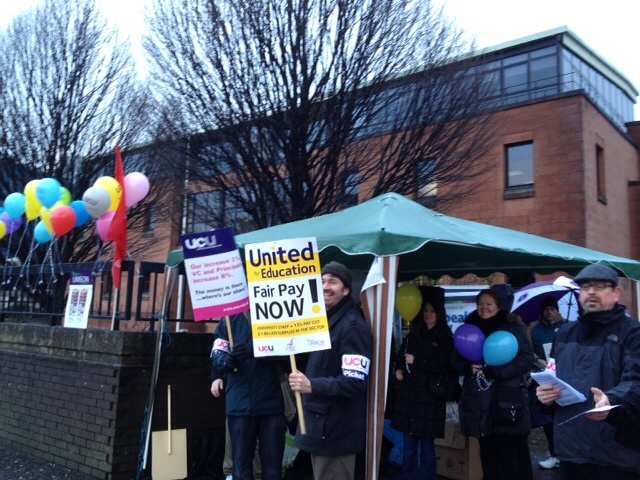 Tuesday 28th January saw Unison member Eddie McKean donating part of his lunch time to give striking UCU members and their supporters at GCU the opportunity to be the audience for some of his latest stand up routines – normally seen at comedy fairs as part of the ‘Bright Club’ of academic stand ups. Hosted at the Students Association, the routine was part of the latest two hours of industrial action conducted by UCU in they campaign for fair pay on campus, following some early morning leafleting to alert students of why some of their classes would be disrupted. During the 2 hour period leaflets were distributed to students in the Student Association explaining the background of the strike, thanking them for their support in the current campaign. This entry was posted in UCU and tagged Eddie McKeen, Salaries, strike, Students, UCU on January 29, 2014 by unionadmin.